Bovine TB is an infectious disease caused by the bacterium Mycobacterium bovis (M. bovis). Bovine TB is a contagious chronic bacterial disease that often doesn’t show a sign until it has reached an advanced stage. Bovine TB primarily affects cattle; however, other animals may become infected. M. bovis causes a disease that can be transmitted between wildlife populations (e.g. deer) and food animals (e.g. cattle). 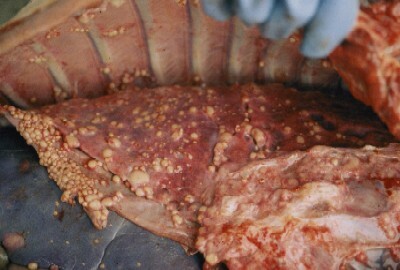 Disease due to M. bovis is typically present in the lungs and lymph nodes of the head and chest, but may also occur in the intestines and other parts of the body. Why hunters should be informed of bovine TB and their role in surveillance efforts of harvested deer? Bovine TB was eradicated from cattle herds in South Dakota, an achievement that resulted in USDA recognizing the state as Accredited Free since 1982. During the past eight years, however, bovine TB has been reconfirmed in cattle herds located in Harding, Hutchinson, Tripp and Yankton counties. The South Dakota Animal Industry Board (AIB), owners of area cattle herds, adjacent landowners, and South Dakota Department of Game, Fish and Parks (GFP) are working closely to conduct additional testing for the presence of bovine TB, in both cattle and wildlife. In cooperation with private landowners, GFP has tested numerous deer, pronghorn, coyotes and other small mammals adjacent to these cattle outbreaks. Bovine TB has not been found in deer or other wildlife species in South Dakota. However, experience in other states would suggest that early detection in wildlife is the key to preventing any disease spread for both wildlife and livestock. Hunters are a great resource in looking for signs of the disease in wild deer. Both wildlife and cattle with bovine TB can pass this infectious disease to each other under certain circumstances. Deer and cattle that have direct contact could pose a risk of transmitting bovine TB. In particular, those areas where cattle and deer share water sources or feeding areas, the risk of transmission is greater. Disease transmission occurs in these environments through saliva and the respiration of bovine TB bacteria aerosols. It is recommended that hunters wear rubber gloves when field dressing wild game as infection can occur from direct contact with a wound, or by inhaling the bacteria in air exhaled by animals infected with M. bovis. Fully cooking meat to an internal temperature of at least 165 degrees Fahrenheit will destroy the bacteria. What should I look for when field-dressing deer? Tuberculosis-infected deer may have tan or yellow lumps lining the chest cavity, in the lung tissue, or in the lymph nodes of the cheek, head and neck area. These signs could be mild, with only a few lumps, or severe. Deer and other wildlife species are susceptible to many different diseases and parasites. 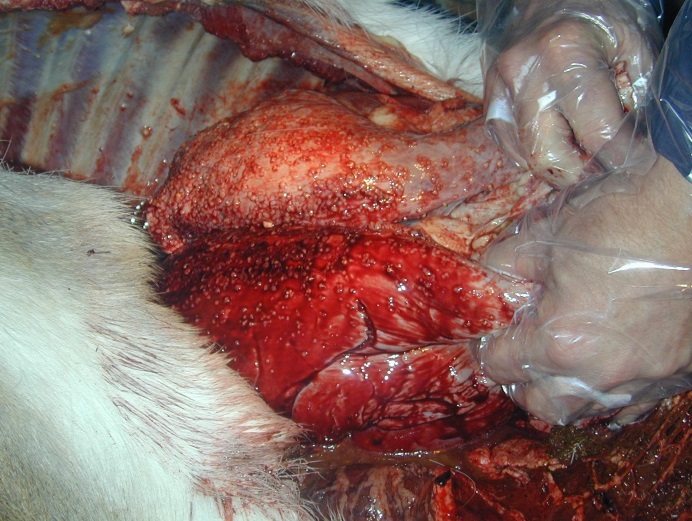 Not all abnormalities encountered when field dressing a deer may be related to bovine TB. 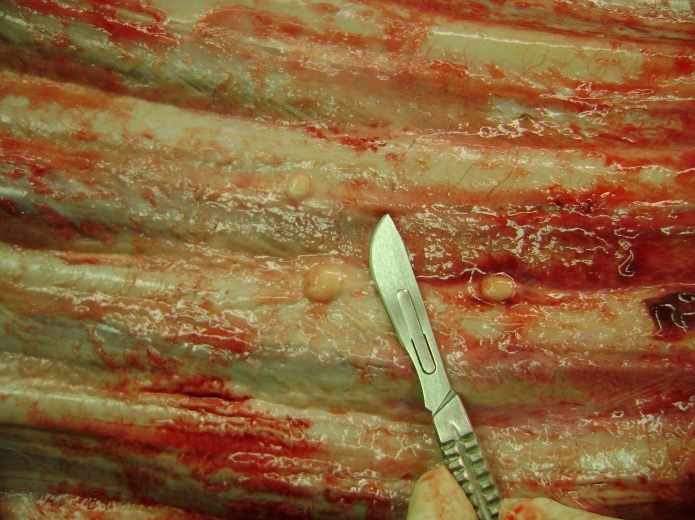 Deer infected with bovine TB may have multiple pea-sized tan or yellow lumps on the inside of the ribcage or on the lungs. What to do if you observe these signs when field dressing a deer? Contact your local conservation officer, GFP office, or the GFP State Office in Pierre at 605.773.3387 and arrangements will be made to have your deer examined. If you have further questions on bovine TB, please contact the SD Animal Industry Board in Pierre at 605-773-3321.